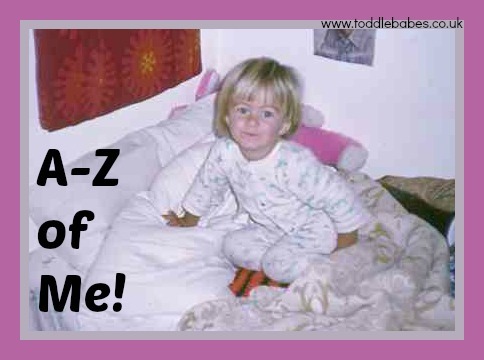 Home » Living » A-Z of me! A- Abhor lazy Grammar/Spelling: I can’t stand laziness in writing. Their/ there, your/ you’re… It’s not that difficult to use the correct one! I am surprised everyday by how many people don’t know the difference-or don’t care. Another one is using these incorrectly; ground and floor. If you are inside, it’s floor, if you are outside it’s ground. It’s also a sink in the kitchen, and a basin in the bathroom. B-Beach: I love the beach and could happily spend hours there. I’d love to have a home by the sea so that I could wake up to an ocean view, take walks along the water edge and feel the sand between my toes. I love the sound of the waves and the changing moods of the sea. C- Children: My children are my world. They are the reason I wake up , the reason I do all the extra things I do and the reason I blog. I love working with children and was happy spending my days in the classroom as a teacher. I am interested in how they learn, how they develop and how to nurture them to be the best they can be. D-Dance: I love to dance and to watch my daughter dance…a body in motion is a beautiful thing. My daughter has already had the privilege of dancing at Her Majesty’s Theatre, Sadler’s Wells, Oxford Theatre and The Cornerstone Arts Theatre through her dance school…and she is only 9! E- Exercise and eating: I know, how could I!? I really love exercise, running, walking, cycling, swimming, anything that gets me moving! I encourage my children to participate in Sport too. Between the 5 of us we do: cricket, football/soccer, tap dance, ballet, modern dance, gymnastics, golf and running, swimming and cycling. I also love delicious meals..I adore seafood and pasta dishes. So really my two E choices go hand in hand…if you want to eat delicious food, you have to offset it with physical activity. 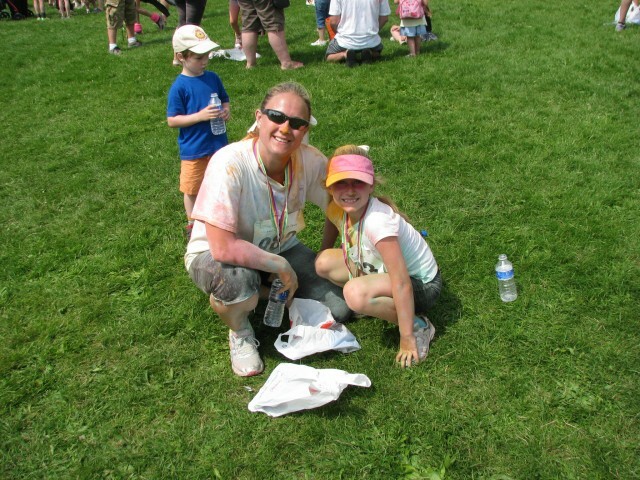 My girl and me after completing a Rainbow Run. F- Family: My Family of Five comes first. I would do anything for them. Nothing is more important to me. G-Gymnastics: I loved this sport as a child and have recently re-discovered it in an adult gymnastics class. Amazing what your body remembers and what your mind thinks you can still do but your body says, “No Way!” I am thrilled that my youngest has started a gymnastics class and is enjoying it…Looking forward to watching him perform. H-Holidays: Well who doesn’t love holidays? I enjoy the chaos, the noise, the people, the preparation, the event and the memories. I always feel a little let down and sad when I have to pack all the decorations away and get back to normal. I start preparing for the next holiday, as soon as the one we are celebrating ends. I- Ireland, India and Iceland: All places I have yet to visit and would love to see. 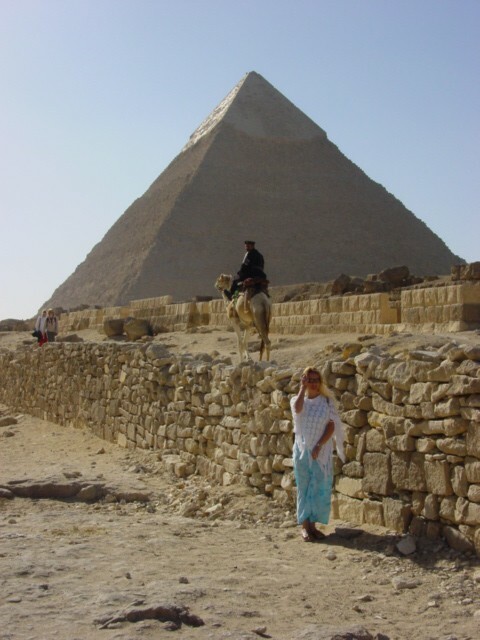 I spent a lot of time travelling before the children arrived and I miss it. 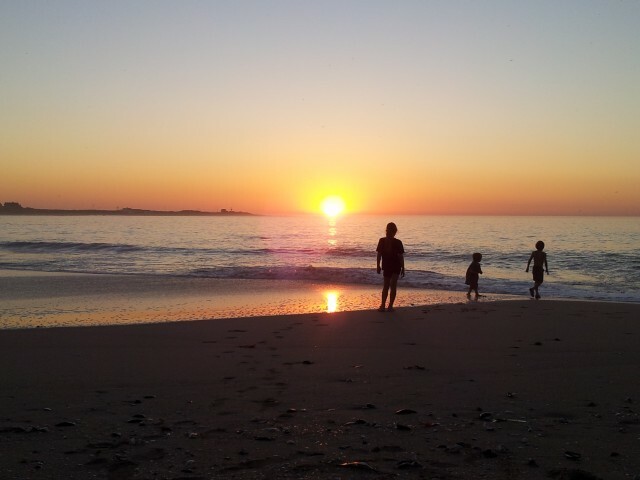 I hope that once they are older, we can travel as a family. I believe travel can be an exceptionally rich learning experience for adults and children alike. 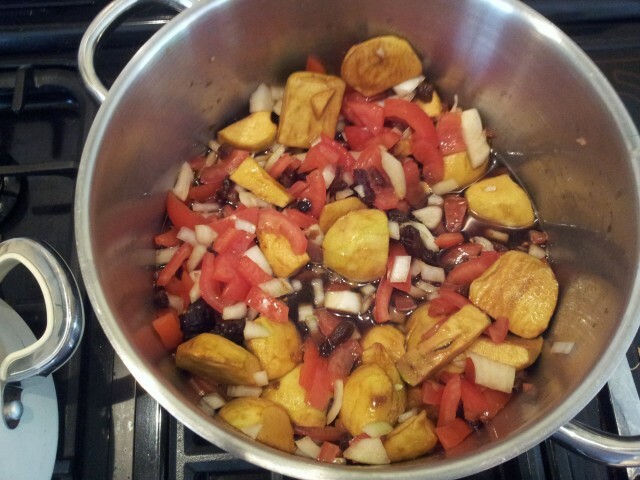 J- Jams, Sauces and Chutney: I enjoy making jams from the fruit I have grown in my garden. So easy, so delicious and so satisfying. I find it wonderful to be able to grow the fruit and then to make it into a delicious treat that everyone enjoys. I love to make apple and plum jam with cinnamon…it’s perfect for the winter months and remolds me of Christmas, strawberry jam, apple sauces, apple and tomato chutney, black currant jam and am excited to add blueberry jam this year, as I have recently planted some in my garden. K- Kisses: Of any kind. Hubby kisses, gentle baby kisses, kisses in the neck, quick running kid kisses, shy school ground bye bye kisses, butterfly kisses..ALL Good! L- Lipstick: A good lipstick can make you feel great. I have wear mostly natural colours but have been known to wear a vibrant red every now and then. My favourite everyday colour is Heather Shimmer (220) by Rimmel London. M- Making and Music: I love to make things. Pretty things, useful things, edible things, scrapbooks and things to give away. I also believe learning to read music and to play an instrument is something everyone should do. In our family we are learning the clarinet, piano, drums and guitar at the moment. N- Nails: I used to bite my nails as a child. We tried all the methods to get me to stop. I finally stopped myself during final exams in high school and have never bitten since. But it does mean that I don’t have the best nails..they grow fast but they break easily. My eldest now bites her nails, and I am having a struggle to get her to stop. O- Oils: I especially love coconut oil. I use it on my hair, skin and nails to keep them in good condition. I use it for cooking instead of other oils too! 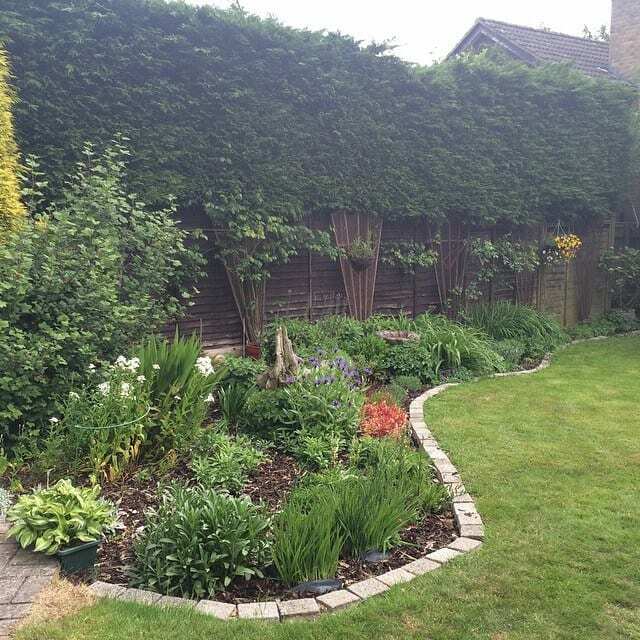 P-Planting: I love digging, planting and growing things in my garden. I find it very satisfying to see my garden bloom into a glorious space each spring and summer because of my efforts. Q- Quotes: I do love a good quote and try to find inspirational and motivational quotes to share. I think an good quote can inspire and focus you. R- Roses: In particular Dallas Roses are my favourite flower. I love their deep, velvety petals, simply stunning. I grow roses in my garden and love the delicate scent and splashes of colour they provide. S- Sleep: Ironically as a child I had a night light. Now I can only sleep in a totally dark, quiet room. No lights from electronics or curtains that are not properly closed, no dripping taps, no humming electrical goods. I am an exceptionally light sleeper. Before the children came along, I used ear plugs…now I just wake for every little thing (thankfully I am not one who needs a lot of sleep) as I worry that wearing ear plugs will prevent me from hearing the children in the night. T- Travel: I love travelling and seeing new places. Experiencing new cultures, foods and traditions. Having grown up in Southern Africa, I have visited a few African countries and since moving to England, I’ve enjoyed France, Scotland, Belgium, The Netherlands, Egypt, Spain and Portugal. I am yet to visit the USA or the Far East…Would gladly accept invites and tickets! hint hint. U- Untidiness: I don’t like mess…I like everything to have a place, be stored properly and be accessible when I need it. We bought our new home 3 years ago and it is a slow process of renovating, updating, altering..It means that the house (or at least 2 or 3 rooms) are always used as storage while the other is being worked on. It means that the house always seems messy! I am currently sitting in my dining room which has not been used as a dining room for the last 6 months as you can’t move the chairs or use the table because it has boxes, piles of paperwork, children’s items that I need to get rid of and art and craft materials. I’m trying not to look at the chaos around me and focus only on my computer screen. V- The letter V: Two of my children’s first names begin with the letter V and the third child would have also been a V if my husband had not vetoed my name choice. It was Vincent…for those who are wondering. Our surname also begins with a V.
W- Work: I am a fan of working smart not working hard. I look for ways to make my workload easier and quicker and like to try out new ways to achieve this. I am always on the look out for ways to earn an income from home so that I can continue to raise my children, stay at home and contribute to our family income. X- X-rays: I have a had a few in my time…3 broken arms, teeth checkups, and even one of my lungs to show to border control in the UK proving I do not have TB. Yes, really. As an African born individual, you are required (might have changed since I did this 15 years ago) to bring a recent chest x-ray with you to border control upon entry to the UK showing that you do not have Tuberculosis, as it is apparently common in Africa. As an aside; I have never met anyone who has/had TB who comes from South Africa in my entire life. Y- Yellow: I love the colour. It reminds me of summer, of citrus fruits, happiness and smiles. I will use it in furnishings, paint and decor, but you won’t find one stitch of yellow in my wardrobe. I don’t and won’t wear it. There is something about yellow that makes my skin look awful. Z- Zero: I have zero tolerance for meanness. It takes nothing to be kind. I am a believer in Random Acts of Kindness and in doing anonymous kind acts. I believe that being kind it contagious. You do something nice for someone and they’ll be more inclined to do something nice for someone else. And how wonderful would the world be if everyone did that?! Thank you for stopping by and finding out about me. I hope you enjoyed reading it as much as I did writing it. I challenge you to think about your A-Z. What is important to you?